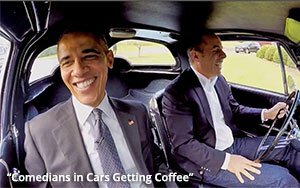 “Comedians In Cars Getting Coffee" is an archetype of Internet content, a ridiculously slight idea that’s dirt cheap to produce and is a passion project of the host. The differences are important, too. The host is mega-famous Jerry Seinfeld and his funny famous pals, and the cars are classics. They never seem to pay much attention to the quality of the coffee. You could do this show on YouTube starring the funniest guy in the dorm driving with his pals to the IHOP in a Ford Focus. Instead, Seinfeld has done it on Sony-owned Crackle since 2012, but that will be ending after this batch gets run through. Netflix announced on Tuesday it will snap up “Comedians/Cars,” new and old, and as part of the deal, Seinfeld will also produce two stand-up comedy specials and develop other projects. Without Seinfeld driving around, a person has to ask, what is Crackle there to do? Why doesn’t it just fold? When Sony started in 2007, it was supposed to be a place for great big Sony to put new Internet content and a bunch of old Sony movies and TV shows. Only the last part happened. Memorably, at its 2015 NewFront presentation, it introduced a bunch of new shows, including a noir-tongue-in-cheek drama “Tightrope,” executive produced by Bryan Cranston, who was there to show the preview reel. (As it turned out, it was a sample of something that didn’t exist.) It looked like it could have been expensive. There have been a few other originals, but nothing that grabbed a nation’s rapt attention. ”Comedians in Cars” caught on. Yet it seems like one of those shows Sony had to say yes to. It made millions off its ownership of “Seinfeld,” so I’ve always imagined, when Seinfeld came up with program idea that pushed the Seinfeldian concept of a program about nothing, Sony was in no position to say no. Not messing with it kept it from obvious corporate thumbprints; not messing with it also kept it inexpensive--$100,000 per episode, reportedly--and kept it pure and simple. Even when Seinfeld went for coffee with President Obama at the White House, the joy of it was there was not much to it, but Seinfeld was endearingly curious. Seinfeld gave Crackle some attention; he was even nominated for an Emmy. The show was named the outstanding digital series by the Directors Guild of America in 2015 and 2016. But after the 2014 presentation, Crackle decided it was really too important to be lumped in with other NewFront content providers and went its own way the next year. It was back to the upfront television universe, where the real high rollers play. Crackle really wanted to be TV, to the point that it introduced an always-on tech in 2015. Now, if you call up Crackle, you join it with a program already in progress, just like when you click on NBC. And just like that, Crackle discovered a heretofore unheralded annoying aspect of TV and transported it to OTT. Sadly, Crackle has never really done anything, and I say “sadly” because it’s ad-supported, owned by a deep-pocketed studio that actually has expertise in the TV business. It could have been somebody. The best of the emerged streaming services — Netflix and Amazon — don’t take ads. (Hulu does, often clumsily.) It could have been a great place for sponsored content (Acura sponsored “Comedians/Cars”), but it seemed nobody at Sony cares to work on that. It missed a moment. Now its best known asset is hitting the road.